This is yet another post on sensemaking (but it has stories in it!). What got me started on the exploration I want to tell you about was something Dave Snowden said in one of his posts about the history of Cynefin. He said "To use Cynthia's words we now have a hierarchy and meshwork conflicted but harmonious." That struck me as funny because I didn't actually say "conflicted but harmonious." I said "conflicted, harmonious." And I didn't mean the comma to mean "but." So that got me thinking - thanks Dave - about what I did mean by that comma. This is where it led me. To put the same question another way: What happens when hierarchy and meshwork combine? And what do I mean when I say the confluence framework, among others, explores that combination? Since most sensemaking frameworks are not models-of-the-world but tools, that question leads inexorably onward to the next question: What are all the practically useful ways we can think about the combinations of hierarchy and meshwork? I've come up with two dimensions of variation in combination that I think are useful to think about: identity and harmony. Before I start, a caveat. This is a blog post. It's not an intellectual treatise, though it could become one someday when it grows up. But at the moment it's just me thinking out loud and hoping to find some synergy with others who are thinking about the same things. 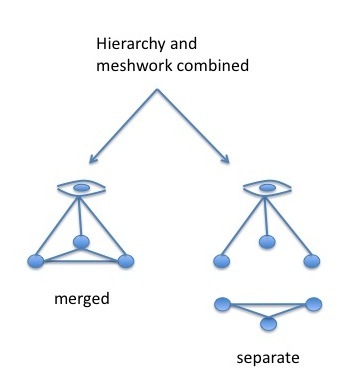 In the separate condition, no one element has both meshwork and hierarchy connections at the same time. Separation of identities can happen in many ways, and they can of course be wonderfully partial and complex. Some separations I can think of are of agency (we do things differently), of social distance (we live in different social circles), of time (we live/lived in different time periods), and of space (we live on different continents). Any or all of these (and more!) could contribute to separation, in intermingled ways. The second useful dimension I can think of is harmony (complementarity, mutuality), or its opposite, discord (conflict, antagonism). 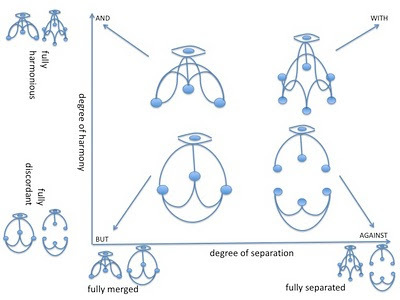 This has to do not with the presence or absence of hierarchy or meshwork connections, but with the relationships among connections: do connections draw other connections close, or push them away? Like sound waves, do they reinforce each other, or do they cancel each other out? When I combine these two dimensions, I end up with four interesting conditions that describe how hierarchy and meshwork can combine. I will look first at the merged condition. When hierarchy and meshwork are merged in one network, the dominant question is: Are we working at cross purposes? Notice the all-important word "we" in that question. On both sides of this figure you have merged networks with both hierarchical and meshwork connections among the same elements. 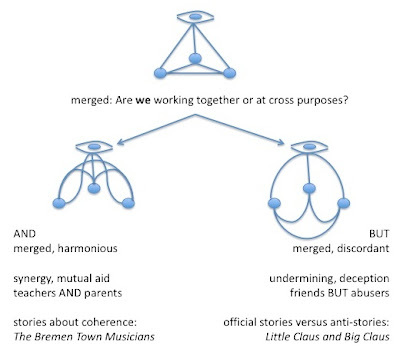 On the left (merged, harmonious), the different connections support and reinforce each other, and we speak of a group doing this and that. Here I draw the connection lines as attracting each other, clumping even. One example is that when teachers are themselves parents, they can often understand things from both the hierarchical and meshwork aspects of the school system, and thus aid both networks as they move between them. 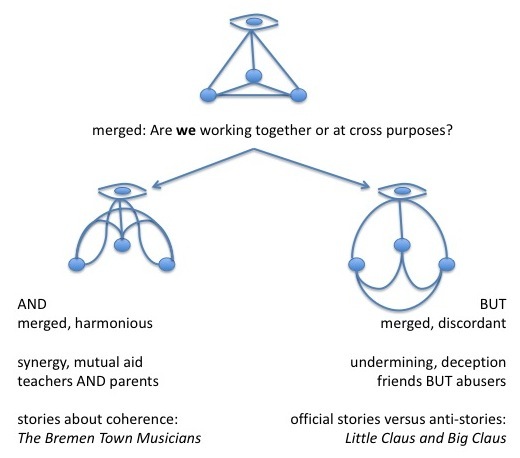 Folk tales about merged harmony tend to feature synergy, or people doing things together that were impossible alone: The Bremen Town Musicians is about a group of animals traveling and supporting each other when each alone was too weak to survive. On the right side (merged, discordant) the different connections repel and work against each other, and we speak of a group doing this but that. Here I draw the connection lines as repelling each other, rushing apart. In this situation people feel conflicts between their hierarchical roles and their meshwork roles and say they are "torn between two worlds" or that others are "Janus-faced" or "talking out of both sides of their mouths." 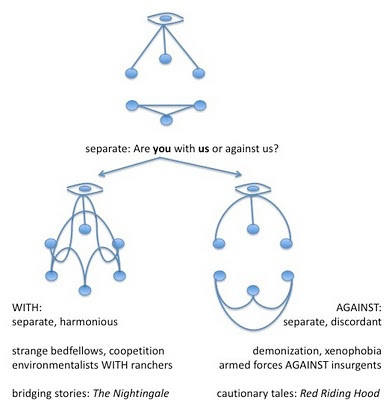 Conflicts take many forms: the hierarchical connections might seize control over the meshwork connections via abuse or brute force; and the meshwork connections might undermine hierarchical connections via gossip and nasty rumors. Here official stories and anti-stories fight for dominance, and people who appear to be one thing (friends) might in truth be another (abusers). These are situations in which deep secrets are "hidden in plain sight" and taboos on who can tell what, where, when, and to whom abound. A folktale version of this situation, on the meshwork side, is Little Claus and Big Claus, in which the powerless yet clever little Claus outwits the hierarchically endowed Big Claus over and over again. Now if we look at what happens when hierarchies and meshworks are not merged but separate, the dominant question is: Are you with us or against us? Note the separation of "you" and "us." Again we have two conditions, harmonious and discordant. 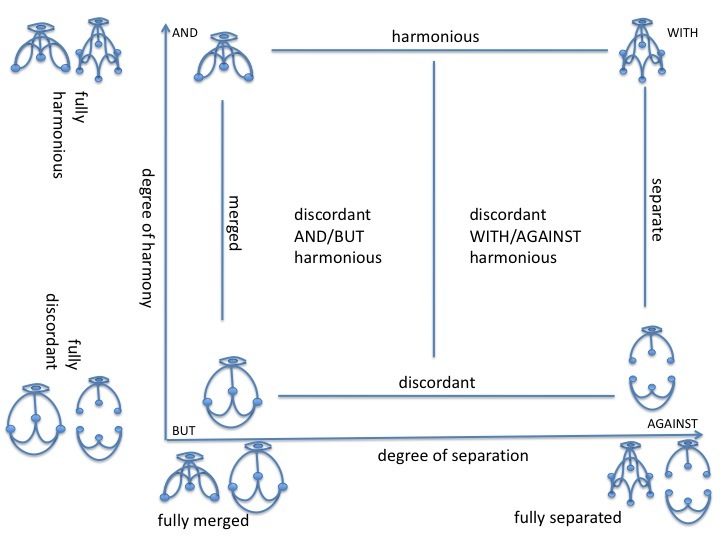 On the left (separate, harmonious), the two separate networks engage with each other in mutually beneficial ways, even though they come from and maintain different connections. Again I draw the connection lines as attracting each other. This is the situation in which we speak of "strange bedfellows" and possibly "realpolitik" and "trust but verify," where people who have little in common find a shared purpose and pursue it together, but without merging. They might teach each other some important things, but they do not merge their networks. In this area are found stories of bridges built between worlds. The Nightingale is an example of this sort of story. The emperor and the nightingale come from different worlds. They do not always agree or live in harmony; but in the end the nightingale teaches the emperor a valuable lesson, and together they teach it to us. On the right side (separate, discordant), the two separate networks work against each other. Again I draw the lines repelling. This is the classic xenophobic, tribal situation in which people "draw lines in the sand" and engage in demonization, simplification and caricature to solidify distinctions. Here are found cautionary tales about misplaced trust such as Little Red Riding Hood, and also much rumor and gossip about "the other" in many social settings. As with the confluence space, the arrows denote the fact that the four diagrams illustrate extreme positions. Now let's go back to the question that started this exploration. As you recall, I said meshwork and hierarchy was "conflicted, harmonious" and Dave interpreted that as "conflicted but harmonious." When I read that, I had a visceral, knee-jerk that's-not-what-I-meant reaction. After exploring all these possibilities, I can now see what produced it. My guess is that Dave was thinking primarily of a merged state, where the elements share one network with hierarchical and meshworked elements in it. This is understandable since that's what the seeing-eye diagram draws. My rapid response was to rush to the right side of the space. Why? I'm an individualist? A contrarian? Too used to working alone? I felt something was being left out? Who knows? But it turned out to be a useful reaction anyway. Okay, so now we get to the what-is-the-point point of the essay. A model or framework or space or set of dimensions has no right to exist, in my opinion, if you can't use it for anything. So let's get into this vehicle and see where it can take us. 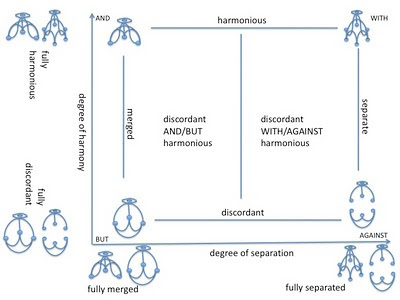 How does this identity-harmony space connect to the confluence framework? I guess it must be some kind of multi-dimensional addition, because at nearly every point in the confluence space (excluding only thin lines along the left and bottom) this how-they-combine space can apply. It's not orthogonal, because something orthogonal has to share one axis. It's more like ... further up and further in. I would use it after I'd done some work with the confluence framework, possibly by choosing elements on the original framework that most directly involve interactions and relationships, since that is what it most involves. "If we were to scan several hundred city plans at random across the range of history, we would discover a more fundamental reason to question the usefulness of urban dichotomies based on geometry. We would find that the two primary versions of urban arrangement, the planned and the "organic", often exist side by side.... Most historic towns, and virtually all those of metropolitan size, are puzzles of premeditated and spontaneous segments, variously interlocked or juxtaposed.... The two kinds of urban form do not always stand in contiguous relationship. They metamorphose. The reworking of prior geometries over time leaves urban palimpsests where a once regular grid plan is feebly esconced within a maze of cul-de-sacs and narrow winding streets." The words "side by side" indicate separation, because for there to be two sides there have to be two entities. However, the mention of puzzles is intriguing, because a puzzle moves from separate to merged as it is built, although one could argue that a puzzle is never really separate, because the image was drawn before the pieces were cut apart. Building a picture out of two puzzles would be a good example of separate networks working together (or merging; which is it?). To choose another example, let's consider for a moment the BP oil spill. BP and the US government agencies concerned with regulating the oil industry are both organizations with more hierarchy than meshwork in their mixtures. Internally they are probably a mixture of AND and BUT relationship patterns. However, after the spill other groups are now more obviously involved (though they were before as well): the various meshworks of fishermen, wildlife enthusiasts, environmentalists, and homeowners living in the areas affected by the spill. These meshworks are separate from BP and the US government agencies, and they are now operating with a mixture of WITH and AGAINST dynamics in relation to those entities. (It seems the balance there is much closer to AGAINST than WITH.) Now certainly a BP engineer, or a volunteer cleaning oil off pelicans, or a newly idle shrimper, or a government inspector, or a politician representing a shore county, would see these relationships differently, and that would be worth exploring. I wonder if, by using this framework, people might discover opportunities in areas of the space they had not considered. Perhaps they might be mistaking a WITH relationship for an AND relationship and trying to create artificial homogeneity, which might destroy the benefits both AND and WITH cooperation could bring. Or perhaps people might have a stronger shared identity with another group than is obvious at first glance, and because of this they might be mistaking BUT discord for AGAINST discord. I suppose the "success strategies" in each of these conditions would vary; certainly the same action that would repair a breach in one area would create one in another. Thinking about trajectories over time, and the possible consequences of various actions, in the space might also be fruitful. Do you know how, when you are working on something, a song keeps playing in your head, for no reason apparently, and then you realize it's some part of you sending a message to another part of you? Lately as I've been thinking about this how-do-they-mix issue, the song "Ebony and Ivory" keeps playing in my mind. This is a fascinating interplay of connection statements. The first section seems to say clearly, if metaphorically, that the two types of people/keys are different. There's that "side by side" again. By itself I'd place that section somewhere between WITH and AGAINST (maybe closer to AGAINST and hoping to get closer to WITH). However, the second part draws on merged identity: people are the same, there is good and bad, "we" learn together. Taken together, the song seems to tell the story of a hoped-for trajectory: from AGAINST to WITH, and then to AND, someday. But the song ends with five repetitions of the phrase "Ebony, Ivory Living In Perfect Harmony" -- which seems to me to accept the hard truth of the separation of WITH, for now. So, as my high school band teacher used to say: Clear as mud? Seriously, tell me. Does this make sense to you? Does it seem useful? (Or am I spinning out into endless space?) If it's not useful, why not? If it is useful, what do you think you could do with it? It is astonishing (nostalgic, wistful-inducing) to re-enter the world of your blog after so many years without contact. I'm here because of a post to me with a link to you on another blog. I had forgotten how much I enjoyed your very distinctive voice. Even when I don't completely follow everything you're saying. But your honesty has a quality that resonates strongly with me...makes me think of the word "plangent" (though without the sense of melancholy). Reading your writing now, there's too much to say in this place. But I am thrilled about your family news - well, not news to you but to me. And I'm thinking that you might find rewarding a connection with another friend of mine, David Boje, since he is also keen on The Walking People and has a colleague, Kaylyn Two-Trees, with whom he has explored ideas and approaches in that arena. I think you would also enjoy the writing of Mikhail Bahktin, if you haven't already done so. His pioneering thinking about human communication - for example, about the kind of understanding that emerges from "a plurality of independent and unmerged voices" seems to me to relate well to some of what I have read here. Also, you might like to look at my blog, practicaltrust.com. Though I haven't got the comments working yet...you're much better at these things than I am. Adding the "but" was intended to make the paradox of the combination more self-evident. Its my philosophy training; make something into a paradox are you are forced to think differently about the issue. It contrasts with dilemma theory where you have to make a choice. Oh, should have said this as well. In the context of the use of "seeing eye" in the complicated domain of Cynefin the use is, as you say "merged". I haven't published the new model of the complex domain yet - I am still playing with it and not ready to think aloud. However in case you are interested, the above post has helped me thing differently about some aspects of that. Great post as usual - many thanks. Reminds me of some work I did some years ago on a similar spectrum-matrix, with 'competition' vs 'cooperation' on one axis, and 'with' vs 'against' as the other. This gives us a similar four extremes, 'competition-with', 'competition-against', 'cooperation-with' and 'cooperation-against'. Competition-with, for example, occurs in many sports or in functional debate, where the aim is to push each other to greater heights of achievement; cooperation-against occurs where we work together in order to increase our ability to put someone else down. It's not the same model as yours, of course, but there might be some useful cross-synergies there? Catching up on comments here, sorry to respond in a "merged" fashion. Ted, it is great to touch base with you again, and yes it certainly has been a long time! I will definitely be taking a look at your blog and book. Have read some of Bahktin, should read more. Have mixed feelings about Boje, bit too much of the precious expert in his work and not enough of sensemaking-power-to-the-people which is where I like to live. But my mind is open. Let's stay in touch! Dave, that's interesting about the paradox reasoning behind your interpretation. Of course not everything's a paradox! As they say, moderation in everything, including moderation :) I'm actually amazed that I never saw how the seeing-eye was only-merged before; should have seen that long ago. Glad if it spurs more thought. Tom, you are absolutely right about the palimpsest. I hovered over that part not knowing which to write. It's more a mix of both isn't it and the practical issue is probably more important. (Maybe I just wanted to get that anti-establishment jab in ;) I like your cooperation/competition with/against very much and need to think about how it relates to this. It seems in a way that you were considering only the "separate" side of the space, and in that sense your thing is orthogonal. Certainly worth drawing on some napkins about. But as with all sensemaking work the proof is in the pudding - if this doesn't actually help people get somewhere they want to go, it's just a pretty picture. Ted Taptiklis directed my attention your way. Not knowing your work, I have got to say this post was about as clear as mud to me. However it did put me in mind of some good academic work: Pearce and Littlejohn's "Moral Conflict: When Social Worlds Collide" (1997). A useful book. Geoffrey, thanks so much for the comment. I was further "in the onion" on that post than usual so it probably was more confusing to more people than most. Your comment has contributed to a whole train of thought that is milling around in preparation for the next blog post. And I'm looking up that book now! Thanks so much.